Our new series brings together all of our advice and tips about the importance of your credit score when buying a home. Most buyers need to take out a mortgage, and that’s when your finances become an open book. Lenders will need to guage if you’re worth the risk to lend you money. Your FICO score and credit report are so vital to getting a loan, and we’ll give your strategies so you don’t miss out on becoming a homeowner. This first week, we discuss why you do need a credit card, and that you use it smartly. If you feel more financially responsible since you never use a credit card and pay cash for most things, then you might remain a renter longer than you’d like! How’s that you might ask? Because in order to qualify for a loan, your lender needs to see that you have established a “credit history” … and you can’t do that without a credit card. Credit cards are essential in helping you establish a credit history, more so than a car or school loan. Mortgage lenders and the bureaus who determine your credit score want to see how well you “borrow credit” and handle monthly payments. They use this “history” to evaluate you. But don’t rush out to get more cards … you MUST use your credit cards correctly or you’ll create a poor credit report. If done correctly, having a credit card can actually INCREASE your credit score. If you want to become a homeowner, then you need to be a smart credit card holder. It’s important that you know what to do and what to avoid in order to be deemed “credit-worthy” in your lender’s eyes. Your FICO score in your credit report plays a big role in the loans you’ll qualify for, the interest rate you’ll get, and whether a lender will even work with you. Plus, it can take at least 6 months to build or improve your credit, so start planning now if you want to buy a home in the coming year or so. Gone are the days when you could sign up for any general-use credit card – AMEX, VISA, MasterCard — on a whim. That’s good though since so many young adults misused them and got deep into debt. Now it can be tough to get your first general-use credit card, and we’re not talking about a department store card such as Target, H&M, or Nordstrom. So where do you start to a build a credit history if you can’t even get a credit card?! Here are some options to consider that help establish credit and are a gateway to getting your own credit card for general use. Secured credit card — Backed by a cash deposit you make upfront that also sets your credit limit. It’s just like a credit card in which you make a payment on a due date for your purchases and face interest charges if you don’t pay your balance in full. It’s a short-term option to have 6 months or so; when you cancel you get your deposit back. Co-signed credit card – You may be able to get an unsecured credit card (no deposit) if you have a co-signer. That person is responsible if you don’t make payments. If you do pay your bills on time, then that’s reported to the credit bureau and helping your FICO score. Authorized user on another person’s credit card – You’re added to someone else’s card, usually a family member, where you can make purchases and build credit history but you’re not the one legally responsible for payments. Department store cards – These are easier to get since the lending standards are not as stringent as for general-use cards. These stores are all about building brand loyalty with customers! A good first step in building credit history if you are careful — they’ve got much higher interest rates so aim to pay off your bills in full if you go this route. These options are like baby steps to building up your credit history. It’s a start and you’ll then reach the point where you should qualify for that VISA, MasterCard, or American Express Card. In order to even have a FICO score, you need to own a credit card and use it for at least 6 months or longer. Plus, the creditor of your card must be reporting your activity to the credit bureaus over that time period. Lenders require a FICO score when reviewing your loan. Even though it’s one component of your credit report, lenders weigh it heavily. This score helps them determine if you are worth their risk to lend you money. The higher your FICO score, the better your credit and you’re deemed less risky. A score of 650+ is considered a good score. So think of it this way — no credit card, means no FICO score, and therefore, no loan. Once you get your card, you’ll be on your way to building credit once you start using it regularly for 6 months or more. You’ve got to use it in order to build a credit history! Using your card and paying off your balances will create a good credit utilization rate or debt-to-credit ratio. This figure measures your total outstanding balance against your total available credit. Keep in mind that this ratio accounts for a third of your credit score. Try to have zero balances as you build your credit; but if you must, try to keep your balances below 30% of your available credit. That helps your score. Look at the next 6 months or so and develop a strategy of purchases and payments with your credit card(s) that will work with your budget. You want to pay your bills on time and if possible pay off your balances each month. Sixty-five percent of your FICO score is your payment history. You can open another card to increase your line of credit, and thus improving your debt-to-income ratio. But don’t go overboard and open up too many. Take it slow and be methodical so you don’t ruin your credit when you’re just starting out. Department store cards can become a dangerous habit so be wary before opening one. It seems that every salesperson at checkout will ask if you want to get a card and save on your purchase that day. Don’t be swayed each time or you’ll end up with 10 cards with high interest. Stick to a couple of stores that you will use regularly and can pay off monthly. 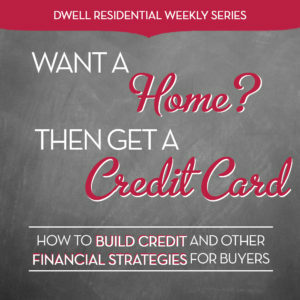 Having a strategic plan to build credit to become a homeowner is a great way to develop good credit habits. You can become the type of dependable customer that lenders love … you know how to responsibly “borrow” money and make payments. Your credit habits – how you handle your debt and payments –are lifelong skills that you need to continue to work on. And it’s not just about qualifying for your first home’s mortgage, but you’ll need to qualify for your next home’s loan, and you may want to refinance at some point. Keep it up and your credit history will allow you to make more choices for your future goals as a homeowner. Next week, we’ll cover ways to build up and maintain a good credit score. 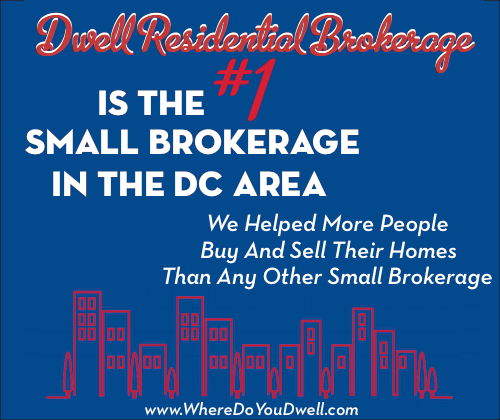 There a some things you NEVER want to do, especially if you’re in the market for a new home! So look out for Don’t Be Roadblocked by Your Credit Score, the next installment of our 4-week series.